This is a very practical set of everyday cookware, complete with tempered glass lids for the saucepans. The All-Clad company created these in partnership with Celebrity Chef Emeril Lagasse, with a few details customized to his specifications. These are constructed of 18/10 Stainless Steel. That number is a technical way of saying there is sufficient Chromium and Nickel in the steel for good corrosion resistance. These have a thick layer of Aluminum bonded to the base as well, which helps in even heat distribution. There is a layer of Copper on the base as well, just for decorative purposes in this case, as it is too thin to have any heat distributing effects. Stainless Steel has many desirable properties for cookware. It's durable, highly resistant to stains and chemically unaffected by any type of food cooked in it. There are no fragile coatings to be scratched off, so you don't need to baby these with soft utensils. However, the polished exterior of this cookware needs to be periodically cleaned and buffed with a cloth to stay shiny and attractive. 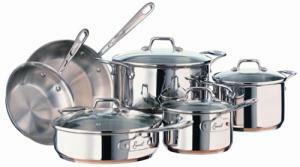 This Emerilware line of cookware is priced considerably lower than standard All-Clad sets of similar size. The reason is that, although this specially branded cookware carries the All-Clad trademark and guarantee, it is manufactured in China rather than at the All-Clad factory in the United States.